Transformers (RoboCar) Jumper is the perfect choice for your Transformers theme party. We from BounceHousesForRent.com will provide you with this new and clean Transformers Robocar Theme Combo 1. Our price includes delivery, setup, and pickup within our delivery area. We serve parts of Los Angeles County and Orange County, California. Delivery was on time and driver accommodated our pick-up time request. Set-up and take down were prompt and efficient. Courteous service. Will use again in the future. This is the first time renting a bounce house and the service was excellent. The driver was very polite, nice and on time. Definitely will order from here again. First time using Go Jumper. On time and very professional. They cleaned the jumper after set up. Will use them again! 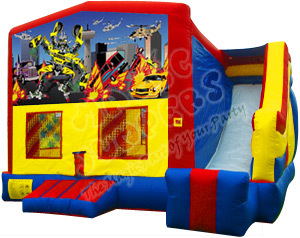 The bounce was a hit for my son's bday and the transformer theme was great. Great service.